← Kol Nidrei Appeal 5775: Stretch, don’t Kvetch! 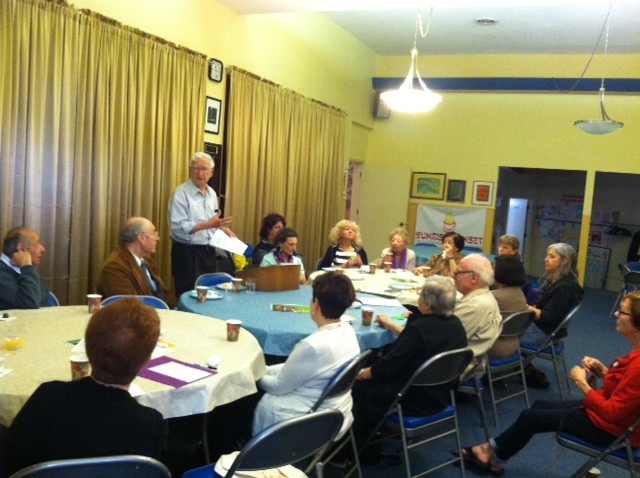 Seventeen women and four men attended the annual Sisterhood Brunch at B’nai Emunah, Sunday, October 19th. The brunch table was replete with delicious foods enjoyed by everyone. After round-the-table introductions we had a brief Sisterhood meeting to share information about the upcoming Hannuka Bazaar and Craft Fair, Sunday, December 7th, the synagogue’s 65th anniversary weekend celebration of Dec. 12 – 14th and collect ideas for future programs. We also learned from the treasurer’s report that Sisterhood donated $7,500 to the congregation last year. Francisco State University professor, has taught at USF’s Fromm Institute for fifteen years. He delighted us with snippets and excerpts from his recently published memoir, Survival in Paradise: Sketches of a Refugee Life In Curacao.” He shared his memories of escaping with his family from Holland in the early 1940s via a lengthy journey through France, Spain, Portugal, Suriname and finally Curacao. His stories of family life and being a refugee during the Holocaust elicited the sharing of stories from some of the attendees. More copies of his book were in demand than what he brought for the after-talk book signing, so arrangements were made to provide more copies. Many thanks to the women who helped with set-up and/or clean-up: Linda Wertheim, Janis Seeman, Susan Tauber, Jennifer Joseph, Flori Green and Bonnie Lindauer. This entry was posted in Congregation News, Interfaith Event, Jewish Learning, Members Achievements and tagged Community event, Conservative Synagogue San Francisco. Bookmark the permalink.